Attention! As of 08/16, the sale is still going. We have plenty of yellows for every application. THMotorsports is having a huge Koni sale currently! We thought it would be a great idea to offer Koni's with Ground Control Coilovers, top hats, etc. We are offering the OTS Koni's which handle 600lbs max of spring rates. We also are offering the Race Koni's, for those looking to track their cars. All prices are shipped. We stock all Koni applications mostly. 88-91 Honda Civic $PM FOR NEW PRICING!!! 92-00 Honda Civic $PM FOR NEW PRICING!!! 90-93 Acura Integra $PM FOR NEW PRICING!!! 94-01 Acura Integra $PM FOR NEW PRICING!!! 98-01 Acura Integra Type R $PM FOR NEW PRICING!!! 01-05 Honda Civic $PM FOR NEW PRICING!!! 02-06 Acura RSX $PM FOR NEW PRICING!!! 04-06 Acura TSX $PM FOR NEW PRICING!!! 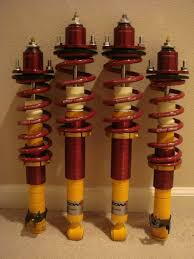 STAGE II DEAL: 4 Koni Yellows Shocks, 4 Ground Control Coilovers, 2 font Top hats Etc. **Master Card, Visa, Discover, AMEX** OR PM US!!!!!!! Last edited by THMotorsports; 12-27-2017 at 02:11 PM. How much for Koni yellow shocks alone shipped for 2000 Integra gs-r ? Jitu, I replied to your email and sent you a google checkout request. give us a call and we would be able to take care of this for you!!! Prices lowered, great deals here! Thanks everyone for the orders. need a price for the koni yellow/ground control package please for a 88 crx? gc/koni combo with tophat pricing for 90 crx si shipped to 91950. D. Young thanks so much!